Imagine real-time data and information streaming in a mid-air, 3D interface (think Tony Stark in Iron Man). But instead of the heavy suit and headgear, it involves “smart” contact lenses that provide biofeedback and enhanced vision simultaneously. 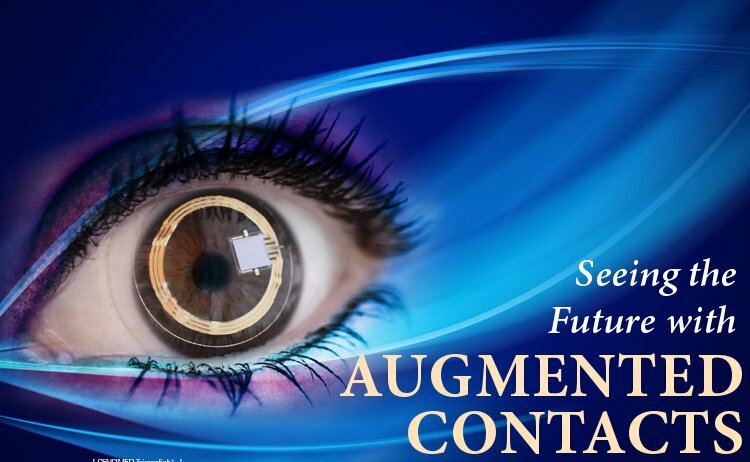 Welcome to the future – a world of augmented reality featuring contact lenses that monitor your health, thanks to the melding of nanotechnology, biosensors and visual digital information that you can manipulate physically. Sounds too futuristic? It’s not. Researchers and bioengineers around the world are working on these devices, including lenses that dispense medication1,2. Some even have stem cells growing on them.3 While many are still in the form of prototypes, others are awaiting or undergoing human clinical trials. And one is already on the market. Instead of chemically induced colour-changing contact lenses, Dr. Babak Parviz at the University of Washington in Seattle and his international team of researchers used amperometric sensing to detect glucose levels in the tear film.14 His sensors measure changes in tiny currents through the tear layer between sets of electrodes. Early tests on rabbits showed they could accurately detect even very low glucose levels. Dr. Parviz, a pioneer in “smart” contact lenses, and his team have also been working on computerized contact lenses with display technology. They have already proven they can shrink electronics and wirelessly power red and blue light-emitting diodes (LEDs) embedded in a contact lens.15 In November 2011, his team successfully activated their prototype electronic contact lens with an unfocused, single-pixel, blue LED on a live, anaesthetized rabbit eye with no adverse effects to the rabbit’s cornea. Unfortunately, while the researchers were able to power the lens from about one metre away in vitro, the distance dropped to about two centimetres in vivo. Dr. Parviz’s goal is to design a better focused, full-colour, higher-resolution display lens that uses internal or less energy to power. We can look forward to exciting times as researchers continue to add miniaturized capabilities to contact lenses with improving nanotechnology. From web surfing to navigating to up-to-date health and safety monitoring – the possibilities are endless. And all of this is without the need for physical headgears, electronic screens or communication devices. The future looks very bright indeed.